Jeep is known for their fun, adventurous vehicles. They are the key vehicle to take out on the back ground and just cruise through the country-side. The Jeep Patriot has a mix of aggressive styling and authentic design. You can get up to an EPA-estimated 30 highway miles to the gallon, getting up to 400 highway miles on one tank. 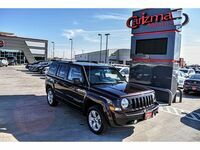 These compact sport utility vehicles often have three choices of transmissions, which include five-speed manual, 6-speed autThe Jeep Patriot provides the ultimate amount of traction. This four-wheel drive vehicle will make sure to get you anywhere you need to go in any condition. Our team at Carizma Motors is happy to offer the Jeep Patriot. We have a variety of years and models to choose from. Keep reading to find out some of the features offered in the Jeep Patriot. There are plenty of safety and technology features included in some of the newer Jeep Patriot models. There is a total of six airbags to keep you and your passengers safe. Some models include ParkView Rear Back up Camera, which provides a rearview image on the Uconnect touchscreen. Some models have up to 53.5 cubic-feet of cargo space if you include the seat space. If you need more space, the Jeep Patriot can tow up to 1,000 pounds. Buying used vehicles are the best way to save money, while still getting the all the features you want. Our inventory is always changing, so if you are not seeing any of the models you are looking for, keep checking back. If you have any questions about the Patriot family, we encourage you to contact our sales team at Carizma Motors. We are happy to take you through our selection and get you inside for a test drive. Interested in a Jeep Patriot?